This study describes a variety of ways of thinking about place in the Renaissance and in Paradise Lost. Despite coming from different perspectives, they have in common the idea that the difficulty of the relationship of reciprocity that poetic subjects often expect from their environment destabilizes those subjects’ understanding, not only of environment, but of themselves. 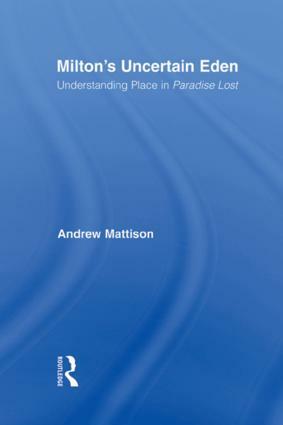 The study explores destabilization as it affects aspects of the poem from Adam’s sense of the landscape of Eden and the meaning of the Fall itself, to the relationship the ambiguous landscapes of Paradise Lost create between Adam and Eve, the poet and the reader; all of whom are struggling to make sense of the same problematically described places. To a surprisingly large extent, the description of prelapsarian Eden and the events that go on within it have in common a failed attempt to understand the nature of the surroundings. In observing the centrality and difficultly of this poetic discourse of place, the problem of place is found at the very heart of the Fall.